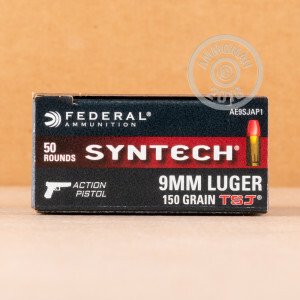 Whether you’re shooting competitively or just looking to get the most out of your experience at the range, Federal’s Syntech Action Pistol line of ammunition has a lot to offer. 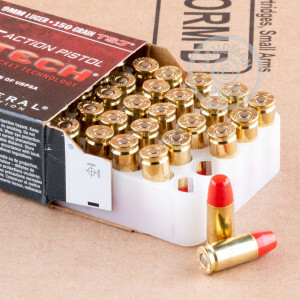 This 9mm cartridge’s 150 grain bullet features a bright red total synthetic jacket, which preserves your accuracy as well as your barrel’s longevity by eliminating metal-on-metal contact between the projectile and the bore. The bullet’s tip has a flat tip to maximize its surface area that comes into contact the target, which is good for shooting a paper target as it will punch a clean hole through it as well as a steel one because it will more easily knock it over. This is a low recoil round, something your wrists are certain to appreciate over the course of a longer visit to the range. The round’s clean burning propellant and lead-free primer are nice and gentle on your pistol’s action and bore, too. With so many features it’s apparent why this is cartridge is the official ammunition of the United States Practical Shooting Association.